There are music videos, and there are music videos. This is the latter. Coming off one of the strangest commercials of all time for FastPass+, Walt Disney World outdid themselves with a commercial for the soon-to-open Seven Dwarfs Mine Train attraction. 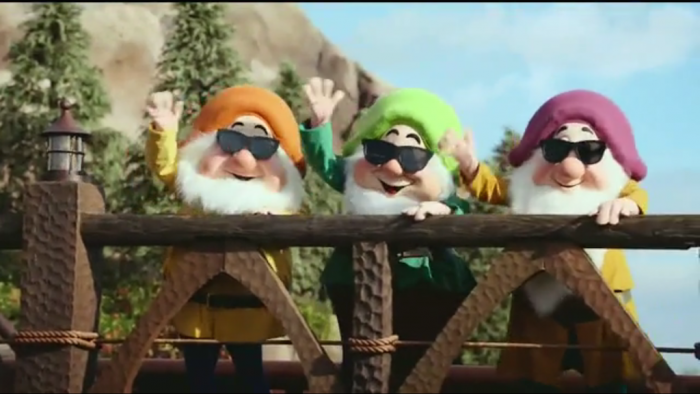 We admit to watching this commercial on a non-stop loop after we first saw it, laughing harder each time. 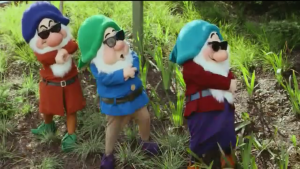 I mean, let’s be honest, when you think of the Seven Dwarfs, who doesn’t think of rap music?! Here’s hoping Disney goes back to this well for future attractions. When Frozen comes to Epcot can we see an Ice, Ice Baby remix? When Star Wars rolls in to Hollywood Studios, how about we turn Gangsta’s Paradise into Jedi’s Paradise? Send us an email Mr. Iger, we have plenty of ideas. This one is still hard to believe, even seeing pictures. Back in April, a test was done at the Animal Kingdom that brought a new walk-around character in Professor Parker Woodson and her velociraptor “Val.” The dinosaur itself was a huge puppet, controlled by a person wearing a black bodysuit underneath. If you had the perfect vantage point, this character actually looked impressive. However, if you were standing an inch to either side, it looked, well, ridiculous. 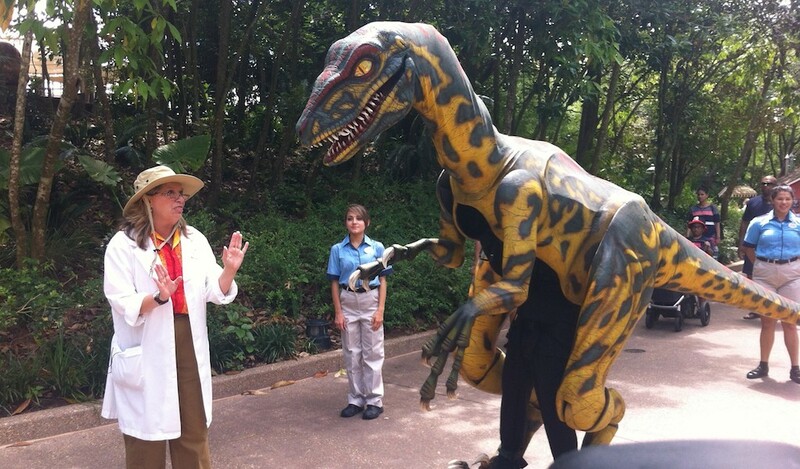 It certainly doesn’t help that both Disney and Universal have had dinosaur characters roaming their parks before, and done much more impressively to boot. 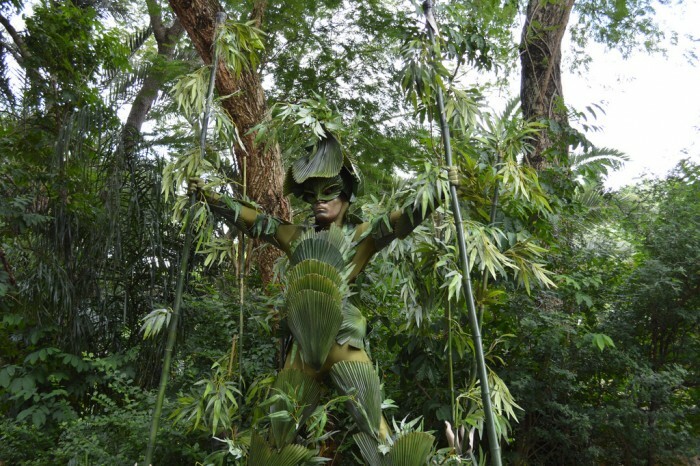 To be fair, “Val” joins Divine, Bamboo, and Mowgli in Animal Kingdom’s long standing tradition of meet-and-greet characters apparently designed to scare kids. 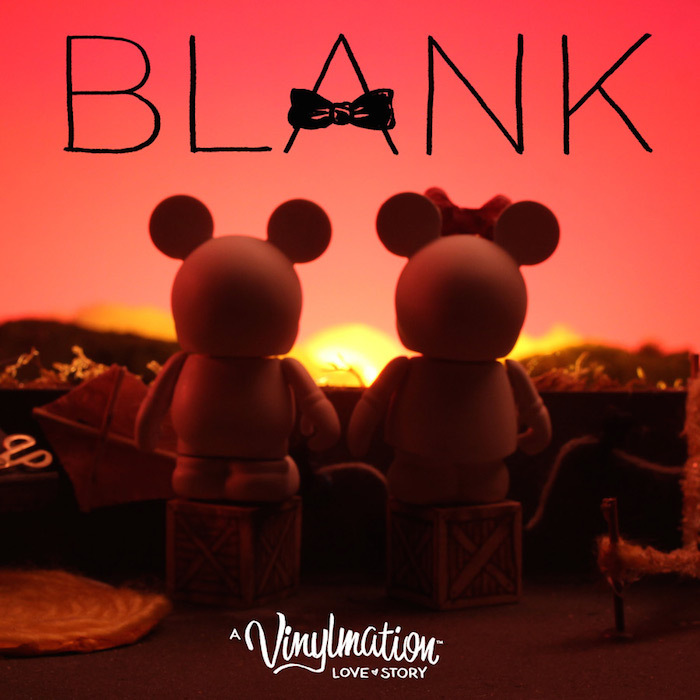 With apologies to any fans of the film, Blank: A Vinylmation Love Story is a 37-minute film that feels longer than the entire Hobbit trilogy. Having a film with no dialogue can be a challenge, even a short one, but we have certainly seen Pixar deliver the goods in that area with some tremendous pieces, including the clever For the Birds and Presto. Let’s not forget the incredible Paperman short that played before Wreck-It-Ralph that wowed us all. Blank goes almost 40 minutes, and while the set design is fantastic, the actual characters and story just don’t connect like a good Disney film should. We would love to see this movie attacked with an editing machete, reducing everything down to a tight 5-minute story. Maybe then there would be something, but as it is, we found Blank: A Vinylmation Love Story to be a bit more creepy than romantic. 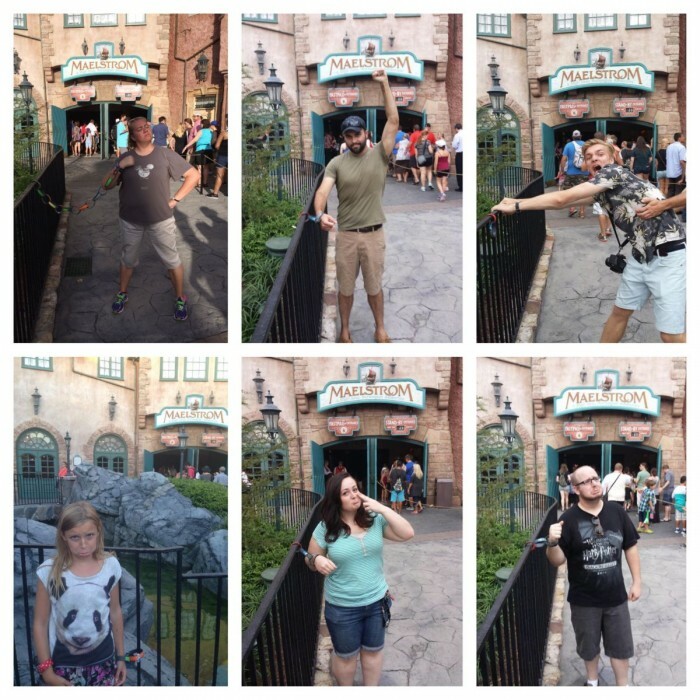 Is it just us, or are guests at WDW becoming just a little bit selfish? We’re used to guests just standing in the middle of congested walkways. We’re used to guests saving seats at pools. We’re used to guests not being ready at bag check, and taking flash photos during dark rides. We’ve all seen breaches of theme park etiquette here and there over the years, but it seems lately that the trickle of selfish behavior is growing into a larger problem of entitlement. 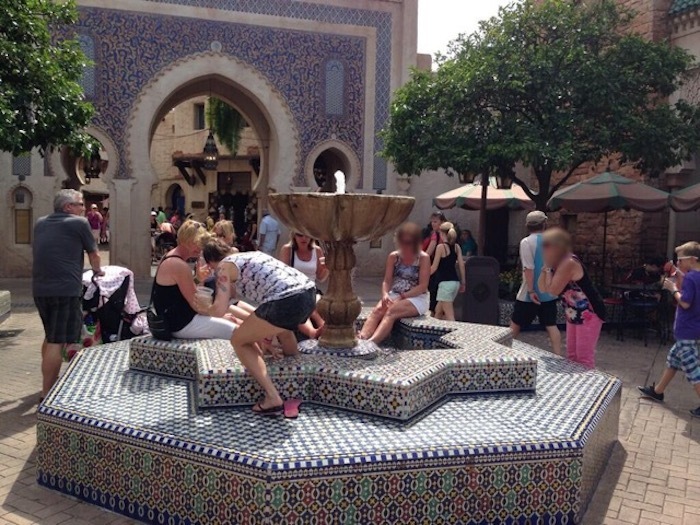 Do people really need to be told not to use fountains at the parks as their personal foot baths? Attractions are starting to have debris just thrown about in their queues (not that Disney is without blame here, as garbage cans have been filled past capacity many times.) Using an iPad to take a photo in the park is a poor choice for a camera, but using an iPad to film a show in a darkened theater is a distraction to everyone around you. What happened to common sense? What happened to treating these parks, and each other, with respect? Do guests need to be publicly shamed into behaving with courtesy? We can be better. We have to be better, because these parks – and all the people in them who work too hard for too little – deserve it. At the start of this year, we were at the Magic Kingdom when a small fire broke out on top of the Under the Sea ~ Journey of the Little Mermaid. 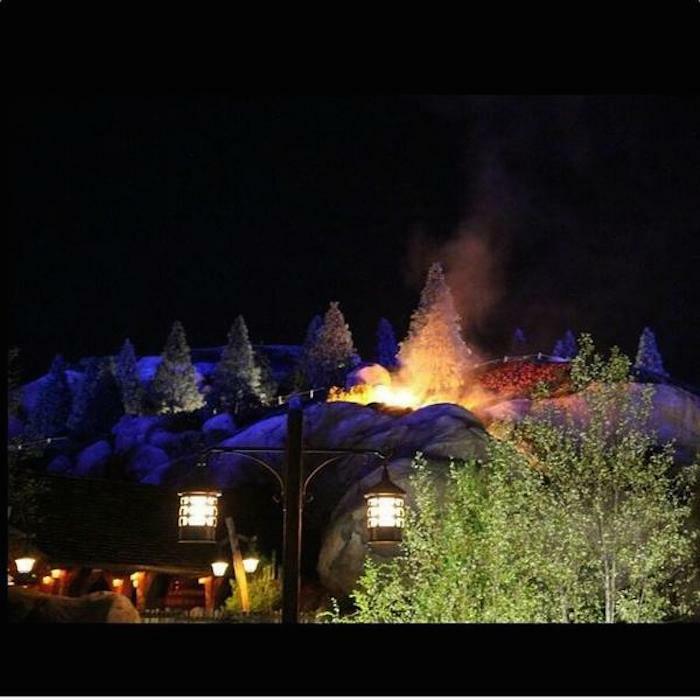 Later, in November, another blaze started on the Seven Dwarfs Mine Train. In both instances, no one was hurt and both rides resumed operation during the night. 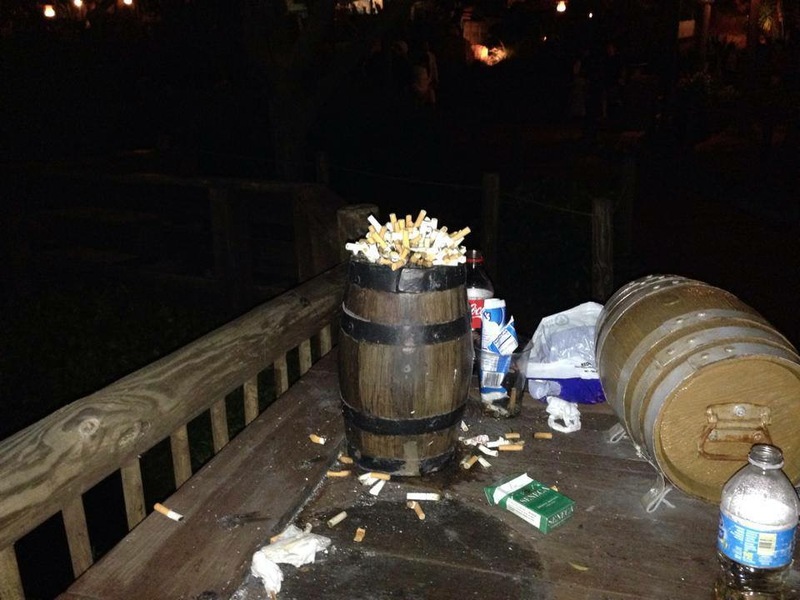 However, both did cause a social media uproar, disproportionate to their effect on the parks. On a fantastic episode of the Disney Dish with Jim Hill and Len Testa, the boys covered the history of fires at Walt Disney World and speculated that the reason we hear about them more now is the availability of smart phones to take pictures/video along with instant access to the outside world. There have been many fires in WDW, most of which we don’t hear about, and yet our theme park routine has continued on uninterrupted over the years. 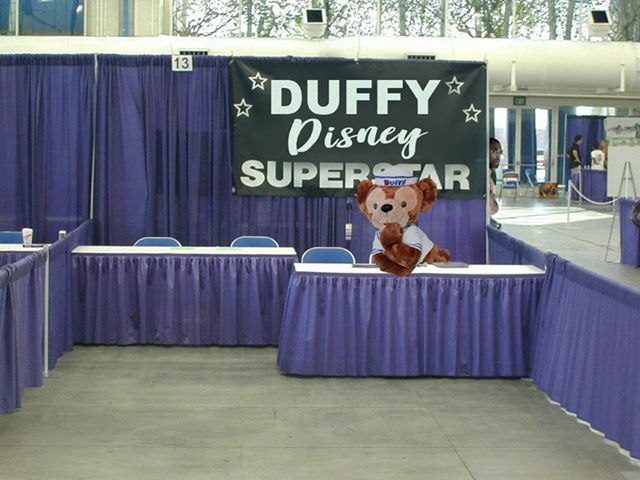 Long story short, Disney has an tremendous response team, and for the most part we as a whole are making a mountain out of a molehill when these stories develop. That said, it sure is fun to be on Twitter when these stories break. Related link: Check out this fascinating page on the history of Monorail accidents and mishaps at Walt Disney World. 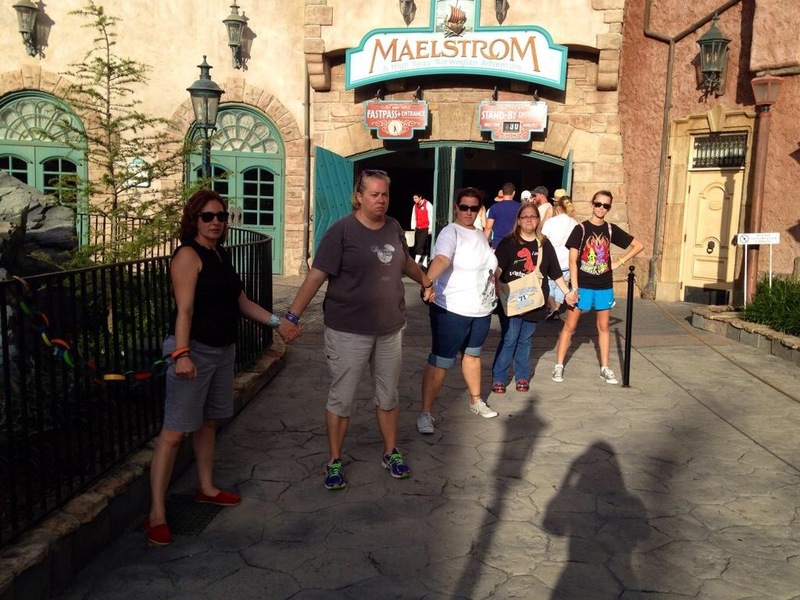 We covered the story of Maelstrom being converted over to a Frozen based attraction in our look at the biggest “Turkeys” of the year, but one thing we didn’t talk about is the rise of the #SaveMaelstrom movement. Just as Twitter and Facebook were instrumental in getting the New Fantasyland fire stories blown out of proportion, the social media tools were used effectively in uniting the entire community in a common goal. People from around the world got to pay their last respects to Maelstrom, and many also took a photo of themselves “occupying” the front of the attraction. It was a bit of much needed levity in a story which had very few bright spots (and let’s be clear, almost everyone wants a Frozen ride, they just didn’t want it replacing one of the only attractions in World Showcase). In the Marvel Universe, we are Groot, but in the theme park universe, we are #SaveMaelstrom. Anyone who knows me knows that I am a big fan of poking fun at the theme parks we know and love. Two of my favorite pieces I’ve ever worked on include: 100% Totally True Theme Park History – The ORIGINAL Plans for the Wizarding World of Harry Potter 2.0 and If I Ran the Theme Park – Decorating Universal for the Holidays. However, there are occasional moments when Disney and Universal do something that is so next level bonkers, that it is absolutely impossible to parody. Case in point, back in early January, Disney brought out members of its senior management to use “Na’vi inspired shovels” for the groundbreaking for the upcoming Avatarland project. George Kalogridis, Meg Crofton, Tom Staggs, Jake Sully (seriously. No, seriously.) Jon Landau, Bruce Vaughn, and Joe Rhode. 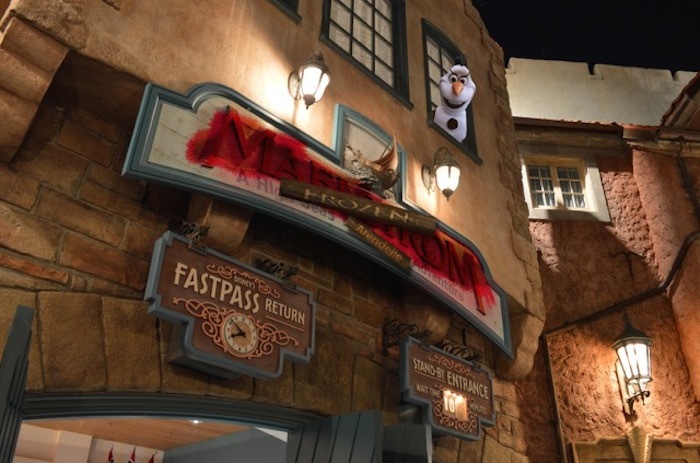 Picture via the Disney Parks Blog. The visual of seeing humans carrying around 10 foot blue shovels is certainly unique, but what takes this photo op over the top is putting a Na’vi into it, and implying he is helping with the groundbreaking. A Na’vi digging up the ground in order to pave it over with concrete to build gift shops and restaurants. Sometimes, I get the feeling everyone in the Walt Disney Company only watched the first half of Avatar, and when they finally get around to watching the second half they are going to come to the same conclusion Gob usually did on Arrested Development. Joe Rhode explaining to Tom Staggs that the last time they had to use these shovels was back in 1998, and for a completely different reason. So there you have it: Six Reasons We’ll Never Forget 2014 (No Matter How Hard We Try). See you next weekend for the latest installment of the SATURDAY SIX, where we take a look ahead at the theme park world 2015! (This time, we promise!) If you had fun, be sure to check out The Magic, The Memories, and Merch! articles, or, for your listening pleasure, check out the Pardon the Pixie Dust podcast. Special thanks to crack staff photographer Brandon Glover, photo-manipulator extraordinaire Matthew Cleary, and Megan Stump for their invaluable assistance with this article. Be sure to also check out Brandon on The Park Blogger podcast with co-hosts Aengus Mackenzie and Brian Carey. Also, we’d like to send a thank you to Attractions Magazine, our all time favorite theme park magazine. Did you know that Attractions were the first people CRAZY enough to let me write a theme park based article? It’s true, and here’s the proof! Funny that you point out the fountains, considering the group on touring plans chat and forum love to post pictures of themselves fully in the water. So apparently touring plans endorses this activity! I like to think of the SATURDAY SIX as the blogging equivalent of Marsellus Wallace’s briefcase in Pulp Fiction. Each reader can take away their own meaning from it. Nixalite in the fountains. That.